Professor Joe Harris kindly introduced to me a book by Nicholas Carr, The Shallows: What the Internet is Doing to Our Brains and I flipped open during a few hours of break in between exams. And I began devouring it. Because once started reading, I couldn’t stop. Upon finishing it, although I wasn’t entirely convinced by all the assertions Carr sets forth, the book has many powerful cases and well-crafted passages that it is worthwhile to share with other readers. Nicholas Carr is the writer of the famous controversial Atlantic article, “Is Google Making Us Stupid” and the former executive editor of the Harvard Business Review. His arguments through chapters, though covering a range of online experience-related themes, is not too difficult to summarize into one main focus: the fact that we are spending a big amount of time online jeopardizes us to think deeply, to read intensively, and to remember things – it is not just the content we encounter via the Net poses threat, but, more importantly, is the side effect from the medium through which these contents are transmitted and consumed; more so, Carr says the change is not limited to a deleterious effect on the way we think, but impacts the neural structures in our brains that enable thinking. What made this book unique is the two notions he puts forward: the loss of “deep reading” (5) and “neuroplasticity” (34)- the discovery that the brain is not hard-wired during childhood, but constantly forms new connections as we acquire new skills, or let old ones lapse. For the first notion, deep reading, Carr argues that the always-on, clicking-in multitasking online mode is rotting our brains, or at least, rewiring our cognition and “patterns of perception” (3) beyond a function of a tool, which people have believed technology to be. He remarks his concentration in reading “starts to drift after a page or two” and his brain begins “looking for something else to do” (5). The deep reading, the way of immersing oneself into a book and fully engaging with all the twists and turns that used to come naturally, now has become a struggle. He worries that the calm, focused, undistracted linear mind “is being pushed aside by a new kind of mind that wants and needs to take in and dole out information in short, disjointed, often overlapping bursts – the faster the better” (10). It’s not just that we tend to use the Net regularly, even obsessively. It’s that the Net delivers precisely the kind of sensory and cognitive stimuli — repetitive, intensive, interactive, addictive– that have been shown to result in strong and rapid alterations in brain circuits and functions. The resource I would like to contribute to our class is a site of blog articles by Mark Bauerlein. 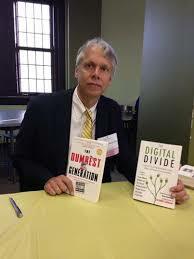 To provide some useful background information, Bauerlein is the author of book The Dumbest Generation: How the Digital Age Stupefies Young Americans and Jeopardizes Our Future and later he edited book the Digital Divide: Arguments for and against Facebook, Google, Texting and the Age of Social. His blog articles concerns the teaching of English, topics ranging from why majoring in English, difficulty of recruiting students for Humanities, the destruction of English Language, digital divide, Googlization, so on and so forth. Mark himself is the Director of the Office of Research and Analysis at the National Endowment for the Arts, the professor of English at Emory University and a periodical writer for The Wall Street Journal, The Washington Post and Chronicle of Higher Education. 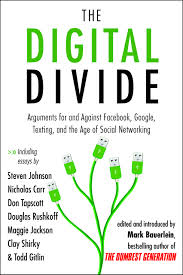 The point I particularly interested in arguing is concerning the purpose of Bauerlein’s published books, the Digital Divide: Arguments for and against Facebook, Google, Texting and the Age of Social Networking that we mentioned in the beginning. I do not completely agree with what Author Jason Jones stated that The Digital Divide functions mostly as an “assembly” of essays by intellectuals, and is best suited for ” anyone who are looking for an orientation about web writing, computing and digital culture.” Jason said people shall spare the money from purchasing Bauerlein’s book, because people can always download these contributed articles contributed to the book online. Have read the book myself to gain a sense of digital culture’s potential and challenges for our course, I consider Bauerlein’s focus on The Digital Divide is not focusing on “assembling” articles on a common theme, but on “arguments for and against” digital writing and social media. As an editor, he retreated himself from the debate of for or against but used the book to debute supporters and protesters from the canvas of past 15 years to join a conversation about how the web has and will continue to affect society and learning. To me, The Digital Divide is almost a mini-history that offers readers a series of analytical arguments about digital technology and social networking. It delivers to the public like us so that we can read what the most trenchant voices have said on both sides of the issues. Bauerlein acted as the director, who pulls together the intellectuals on two sides to debate. The reason for him to withdraw from the debate is that he intended to come off with balanced volume to present to the readers. Yet intellectuals who those who criticized his previous book The Dumbest Generation, such as Clay Shirky, Jakob Nielsen, and Cathy Davidson, contributed their essay to The Digital Divide as the opposite side of the argument (that digital age benefits people) which itself opened up an important question– how to deal with people who have he raised up the question, how to deal with people who have different opinions than yours on one subject. This is what respect about Bauerlein’s philosophy behind this book, that he did not refuse to acknowledge critics but very well aware it is an open discussion, that anyone who assumes he or she has the final say on a radical topic such as the digital age and social media is arrogant and an attempt to close off the discussion. What I interpreted from reading his introduction is that he wants to stretch the meaning and advance the debate, therefore readers will be provided with more latitude in understanding of what digital age means, and come to their own conclusion during the learning. Our course Writing in a Digital Age opened a door for further research on how information will be organized and used, and how students desire to attain instruction and how teachers can better deliver new information to a group of students who think and behave in ways that have been altered by social media and digital technology. Summary of Argument: This essay is more concept-driven than argument-driven. I revisit the impetus for creating the collection and then share the process I’ve gone through to accept the uncomfortable incompleteness inherent in writing personal narratives. I conclude with the realization that my relationship with a published narrative is similar to my relationship with my daughter’s memory in a broader, more diffuse sense. I am torn about how theoretical or scholarly this piece of writing should be. 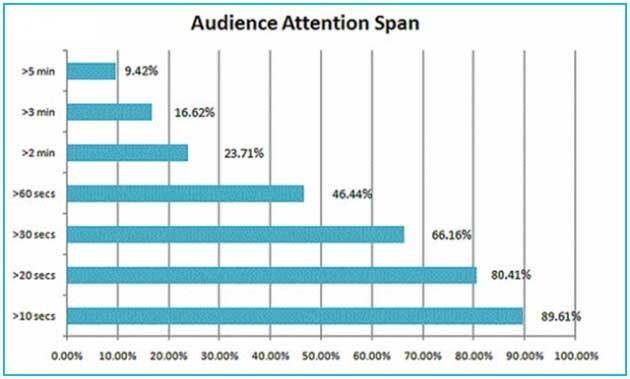 My instinct is to keep it spare in terms of citing others because my audience will be people searching for the book as opposed to readers who want to understand how my ideas about this topic of narrative limitations relate to other writers’. However, I also am concerned that my essay may not doing enough. There is an element of self-referentiality (naval gazing?) to this essay that has me concerned. Would you like to see me engage with other texts more? My piece is intentionally a bit disjointed. Does this form/content connection work for you as a reader, or is it unnecessarily frustrating? This is a more technical question. I want the website to be a) inexpensive but b) good-looking. I registered the domain name theywerestillborn.com (yay!) but am still working through hosting as well as how the website itself looks. If anyone can point me in useful directions for tools or guidance to improve the aesthetics of the website, I would be really appreciative. I would like to include links to several pieces of writing my contributors have done about this or similar topics. Does it make sense to include them as links at the bottom of the page with my essay? Or should they be on another page on the site?